and Integrated Experience Technology market in Asia-Pacific region, Bengaluru based AIT association had recently conducted a seminar to explain their members on the need for convergence bet. AIT’s 3 Hundred odd members have been providing solutions to a diverse base of customers and the seminar was aimed at bringing more value to members. manufacturing destinations in the world by 2020. Buoyed by Indian Government initiatives such as Digital India, Smart Cities and E-Governance, the Indian Pro-AV market is showing remarkable growth and will touch Rs. 50,000 crores by 2022. 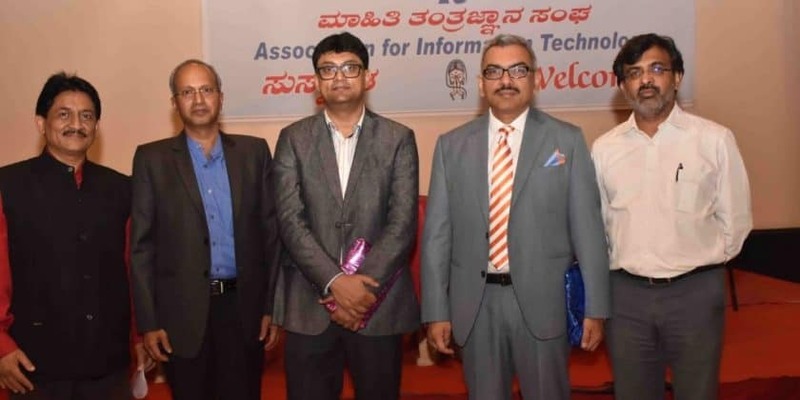 Dinesh Dhanapathi, President of Association for Information Technology, Bengaluru (AIT) exhorted all the members of AIT to move ahead and embrace the convergence of IT and AV sectors and be the front-runners in providing comprehensive solutions to clients. ” The convergence of IT with AV opens up new opportunities for our members. In future, we shall see that the 2 Sectors will be intertwined to such an extent that it is in the interests of all of us to equip ourselves with the skill-sets required to handle the AV business bound to come our way soon.”, Dinesh further added. Speaking at the seminar organized by AIT, Gaurab Majumdar, Regional Director (India & ME) AVIXA mentioned that this will result in major demand for skilled AV-IT professionals and Indian youth should consider training themselves for being a part of this exciting global opportunity. “Established in 1939, AVIXA (earlier InfoComm International) is the Global trade association representing the professional audiovisual and information communications industries worldwide. We have more than 5 Thousand members from more than 80 countries, including manufacturers, systems integrators, dealers, and distributors, independent consultants, programmers, rental and staging companies, end users and multimedia professionals” said Majumdar. “India is today experiencing a skill shortage in this fast-growing sector. We are organizing education courses all over India to impart training on Pro AV technical skills and the demand for training is over-whelming. AVIXA Certification is now accredited by NABET/Quality Council of India” added Mr. Majumdar. Speaking on the occasion, Sooraj Dhawan, India Representative, InfoComm India 2018, made a comprehensive presentation on InfoComm India 2018, the leading Pro AV exhibition and conference, scheduled to be held in Mumbai from 18-20 September 2018. “The transformative power of professional AudioVisual (Pro-AV) and Experiential Communications Technology (ICT) is felt in every industry. Cutting-edge solutions help to streamline business operations, in turn boosting efficiency in the workplace. InfoComm India 2018 is where you can tap into opportunities to harness the power of these solutions. Over 200 leading global players will be showcasing their solutions at the forthcoming InfoComm India 2018,” Dhawan informed. “In a nation which is swiftly transforming itself to becoming a global economic giant, InfoComm India has evolved to become India’s premier exhibition and sharing platform for cutting-edge Professional AudioVisual (Pro-AV) and Integrated Experience Technology solutions. An integral part of InfoComm India exhibition, The InfoComm India Summit in Mumbai offers valuable insights from different viewpoints. These include the InfoComm University Seminar on market perspectives, Industry Forums for specific industry practices, and Technology Forums for technology updates,” concluded Dhawan. AIT claims it is clear that the days of box-pushing are numbered. The forum believes their members will have to innovate, think out of the box and even look at disruptive technologies. AIT has been repeatedly stressing on this aspect in most of the recent fellowship meetings organized for its members. “We are also planning to increase the training quotient of members so that they are better equipped to act as comprehensive solution providers. We want members to use IT to collaborate with each other to ensure all business inquiries are handled within the community and to increase client-delight. We encourage Vendors to make use of the AIT Platform to reach out to the members regarding their innovations, products, and services.”, Dinesh concluded. AIT Eyes Huge Potential in IT-AV Convergence 0 out of 5 based on 0 ratings. 0 user reviews.